The TL3000 family equipment supplied by Abalá will be used for the upgrade to HD for the aforementioned branches, which will be fully operational by January of 2019. This will permit management of embedded audio in HD-SDI signals for post-processing in their editing rooms as well as synchronization of the equipment. 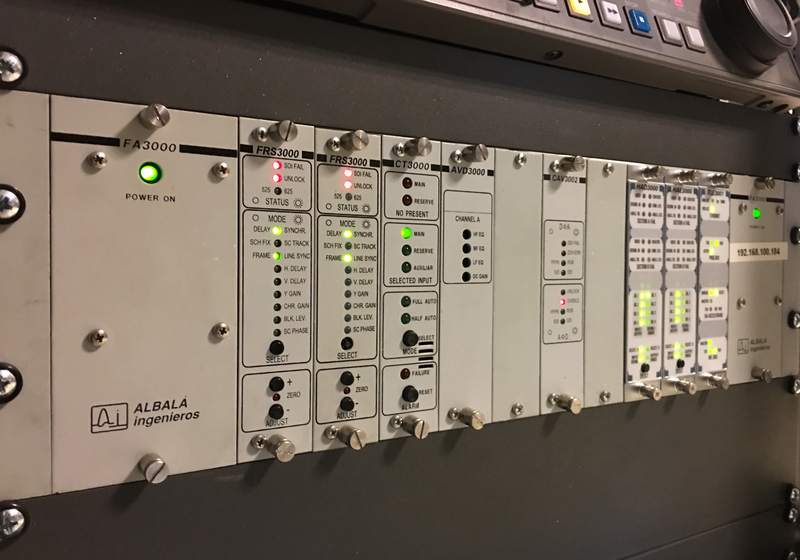 - The TLE3001C02 is an advanced communications controller for use with the Albalá TL3000 family of modular equipment. This module can control any modules that have a remote control feature that are installed in the same mounting frame as the TLE3001C02 via a serial port and/or an Ethernet LAN. - The HTG3001C01 is a module for generation of digital video signals and analog video reference signals in all the formats commonly found in professional television studios. This module can generate 3G/HD/SD-SDI digital video signals and an analog video reference signal with different formats and independent timings. - The VCT3000C13 is an automated switch, designed for switching analog video signals (PAL, NTSC, Black Burst, HD, Trilevel Sync, etc.) that are transmitted over coaxial cabling along with two channels of audio over twin lead cables. - The AVD3001C03 is a wide bandwidth analog video distributor for video in standard definition (525 and 625 lines) and high definition (720p, 1080i and 1080p). The AVD3001C03 has been designed for massive distribution of an analog reference signal, and provides a single section that distributes the input signal to ten outputs. - The HAD3000C01 is a de-embedder of analog audio signals found in 3G/HS/SD-SDI digital video signals. The module consists of two identical sections, each of which can de-embed up to four channels of analog audio from 3G/HS/SD-SDI digital video signals. - The CAV300x family is comprised of format converter modules for high quality component video. In analog format, these modules can process signals in YPrPb format as well as RGB, at both 525 and 625 lines. In digital format, the signal processed is 10 bit SDI at 270 Mbit/s. In the words of Joan Masip Vilanova, Technical Direction of Audiovisual Services at Lavinia, “We trust the solutions from Albalá Ingenieros for their close attention to commercial and technical service, the robustness of their equipment and the reliability they provides for 24-7 operation, 365 days a year”. According to Vicente Polo, founding member of Albalá Ingenieros, “For us it is highly satisfying to once again provide our products for Grupo Lavinia projects and to know that they confide in our work and experience, which is always to invest in the maximum success of our customers”. Grupo Lavinia has once again trusted in Albalá Ingenieros’ technology and solutions for their migration to HD, this time for their ATLAS installations in Valencia, La Coruña and Seville, based upon Albalá’s experience in the broadcast sector and their ample repertoire of solutions for this market.